The bright light of Sunday morning shone on a new day in St. Louis. The heat and humidity have been persistent, but experienced mostly through the short walks back and forth between the America’s Dome Convention Center and the various hotels (in my case, it is right across the street). 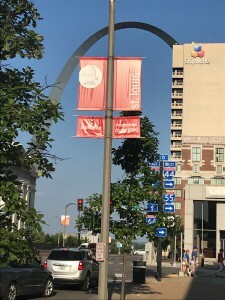 So, unless you took advantage of one of the tours, one’s exposure to the city of St. Louis was very limited. Yet, on Sunday morning, as has been the practice for the past few General Assemblies, commissioners, delegates, staff and observers join together with the congregations of the greater St. Louis area in their normal weekly Sunday worship service. While no doubt, the pews were a little more full, the singing a little more boisterous and the preaching a little more prepared, we were able to experience a little bit of the worship and mission of these congregations. For myself, I had chosen to attend the Third Presbyterian Church of St. Louis. Within this traditional African-American congregation, all of the GA guests were welcomed warmly as we were led in worship by their enthusiastic and talented music ministry (the same group who had sung at the opening reception). Challenging the congregation gathered from both the local neighborhoods and visitors from across the country, he proclaimed the Word of our grace-fueled neighborliness based upon the parable of the “Good Samaritan” in the Gospel of Luke. Of course, we were treated to gracious hospitality afterward where we were privileged to join in fellowship and to hear more about the ministries of this congregation. This type of sharing together in worship reminds me so much of the unity that we have in Jesus Christ regardless of our differences in where we live, our worship practices, our cultural customs or our societal standing. 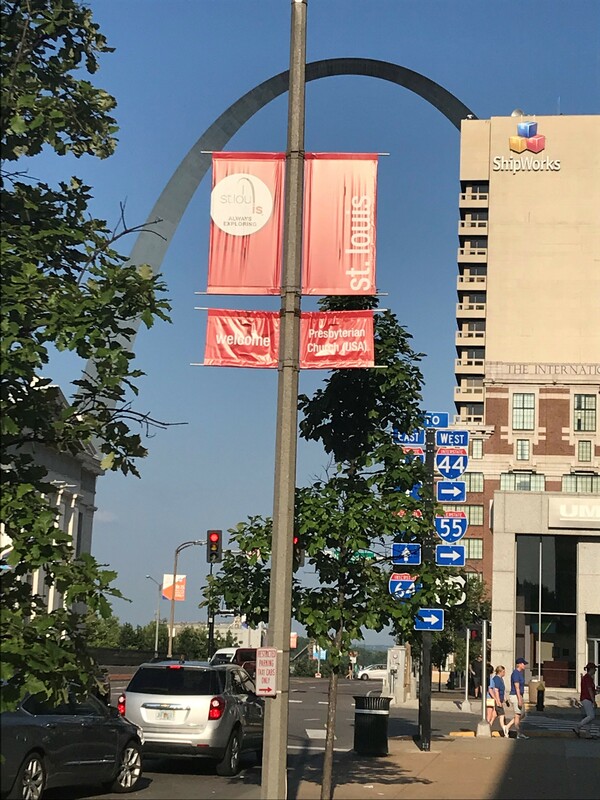 If you have time, I would encourage you to read, see and hear about what God is doing at this congregation in which we were privileged to participate (thirdchurchstl.com). When commissioners returned to the plenary, there were opportunities to hear from each other about their various worship experiences that morning. Earlier in the morning, I had participated in the breakfast for Mid-Council leaders sponsored by the Presbyterian Foundation. As one of the six agencies of the denomination, the Foundation continues its work of assisting individuals and congregations in investing funds in order to create a legacy of ministry over the years. Having personally witnessed the impact of funds invested with the Foundation, they serve as a valuable resource for ministry within our denomination. At this breakfast, we were treated to hear the singer-songwriter, Fernando Ortega. His music provided a great opportunity to begin this Sunday of worship after the long day of labor on Saturday. In mid-afternoon, the General Assembly returned to its work under the leadership of the new co-moderators, Vilmarie Cintron- and Rev. Cindy Kohlmann. Often, Sunday afternoon sessions appear to be less than important after the climactic moments of electing moderators and before the committees “roll up their sleeves” and get to work. Yet, I find Sunday afternoon to be significant as we take time to commission new mission co-workers, hear important reports on the work of God throughout the world. On this Sunday afternoon, we heard from the Stated Clerk based upon the Matthew 6 theme and asking the question, “why did God bring us here for such a time as this?” The call to reform at every level results in transformation not just as an institution, but as a movement of Jesus Christ based upon collective faithfulness. His challenge was to focus not on success, but on significance. The 2020 Vision Team offered an Interim report from their work and presented a draft of the guidance statement. They encouraged members of the Assembly to reach out to them, to communicate, to listen and to comment not merely upon the statement, but the “call” that it represents to all of us (Prayerful, Courageous, United, Serving, Alive). Thanks be to God. A combined report from the Way Forward Commission and the All Agency Review Committee was offered based upon their charge to find a “way forward” for the structure and function of the General Assembly committees and to review and evaluate the various agencies in the denomination in fulfillment of the mission and directives. While they each issued separate written reports, they also offered some share recommendations. You may have hear that there is significant thinking (and disagreement) going into the ways that we structure some of the mission and financial operations of the legal corporation of the denomination. Some of these recommendations will be “tackled” by the Way Forward Committee as we move through the week. Regardless of the particulars of the conclusions, the expressed intention of greater collaboration and more nimble administration are desirable goals. Both reports are readily available @ www.pc-biz.org. With the commissioning of new Young Adult Volunteers and Mission co-workers, we highlight the celebration of our ongoing commitment as a church to mission. New YAV’s and Mission co-workers were commissioned and they join the many others (128 mission co-workers in 70 countries) who actively serve the Lord and our church in this way. (128 in 70 countries). As an Assembly and as a denomination, we commit to support and encourage them that they might be the witness to Christ’s reign of peace, justice and love. By Sunday afternoon, any “new business” must be submitted for consideration. Often, this comes in the form of commissioner resolutions. In this General Assembly, Rev. Sue Washburn has offered a commissioner resolution further challenging the Assembly in addressing the need for ministry in and with those affected by the opioid addiction epidemic. This resolution will be referred to one of the committees where it will be considered on its own or consolidated with other business already before the committee that they would consider to have overlap. As the day moves into the evening, all of the commissioners begin to gather in their committees for opening sessions that are open only to the committee members and leaders. During this time of preparation for their work, they begin to get to know each other, establish processes by which they will work with each other intensely over the next few days and consider the areas that will be addressed through overtures and their advocates. As for the rest of us (staff), we usually either try to “catch up” on other work or find something fun to do in the city because on Monday, the activity and engagement in real concerns will begin in earnest.